Joe Beddia, the man behind the small Fishtown pizzeria that was tasked with the title "Best Pizza in America" by Bon Appétit in 2015, has had a particularly busy couple of years since such widespread attention was brought to his Pizzeria Beddia storefront. Though the shop had received much critical acclaim prior to Bon Appétit’s article, the press caused an instantaneous, relentless demand: Even more than two years later, it’s not unlikely to see people lined up outside the shop waiting for the doors to open at 5:30 to land one of the shop’s limited 40 pies of the day. Last summer Beddia hinted that he would be closing up shop sometime in March 2018, though details have been scarce. Tuesday night Beddia broke some of the mystery surrounding the closure and announced the shop’s official last date. 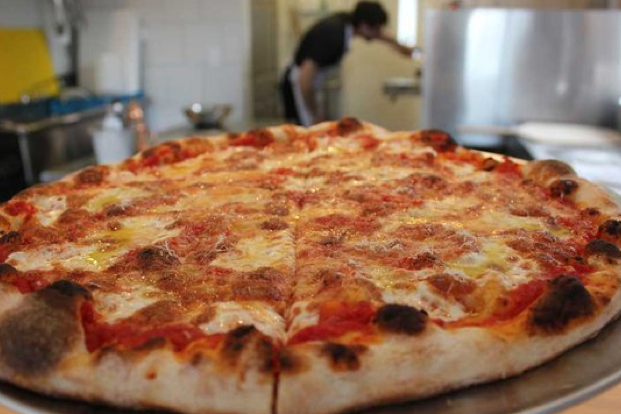 In addition to being closed for a few upcoming Saturdays, including Feb. 10, Feb. 24, March 10, and March 17, “Pizzeria Beddia will be closing on March 31 and taking a breather before opening a larger pizzeria in Fishtown later this year,” the post reads. Beddia has mentioned his next concept vaguely in the past, saying he would train other people and be able to serve more. “We all know it’s not going to be as good,” Beddia wrote in his Instagram post. With less than two months to go until the end of Pizzeria Beddia’s first iteration, grabbing a coveted slice just got even more complicated. Take your shot at snagging a pie when the store is open, Wednesdays through Sundays, at 5:30 pm.